Many Russian tourists travelling to Kerala wonder why buying a bottle of whiskey or ordering a beer in a restaurant in the state is such an impossible chase. RIR tried to find out the causes of prohibition in “God’s Own Country” and its adverse impact on tourism. Kerala made international headlines in August last year when the Oommen Chandy-led United Democratic Front government introduced a new liquor policy leading to the closure of 730 bars, barring a dozen of five-star outlets. The state government also implemented a ban on the sales of Indian Made Foreign Liquor (IMFL), or Indian-made hard drinks like whisky, vodka, brandy and rum over the next 10 years. The Supreme Court later challenged the logic of prohibition. Many professional associations and social activists protested, and finally the policy was put on hold. While the prohibition hurt Kerala on political and communal grounds, it also threatened the industry contributing about 10 per cent to the GDP of “God’s own country”. 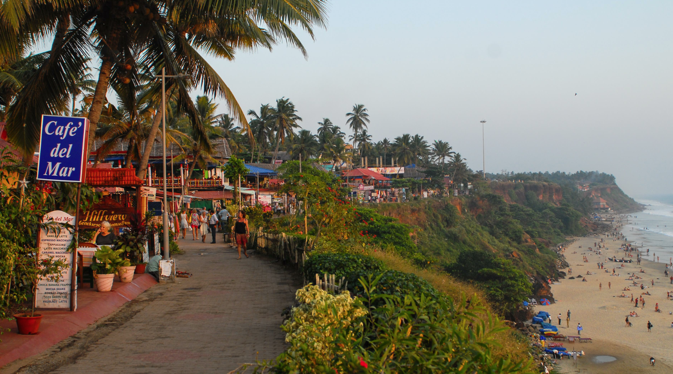 Many foreign tourists visit Kerala for its picturesque beaches, yoga and ayurvedic treatment. Many of them, Russians especially, flock to Kerala for the New Year vacation. While the New Year without red caviar on the table is still imaginable, the festivities, without a bottle of sparkling champagne, is simply not on. Kirill Koteshov, an artist from St-Petersburg, celebrated the New Year with his friends in the tourist hub of Cochin. “To buy drinks for a New Year party we had to go to the only liquor shop in the city at 8 am, and there was a queue there already. The price of a champagne bottle was five times more than it would have been in Russia; we had to cancel the plan to open it as the clock struck midnight”, he recalls. “We ended up buying rum of unknown brand, and later in the night we realised its quality was really bad”. Kirill as well as many other Russian tourists interviewed by the RIR correspondent in Cochin, Varkala and Kovalam said that they had a hard time finding liquor shops in Kerala, and most of alcohol sold there is of unknown local brands while the prices are very high, compared to Goa or other states in India, even Russia for that matter. It makes it even more amazing that tourists have problems finding alcohol shops in Kerala: “God’s own country” is known as the hardest drinking state in India. Johnson J. Edayaranmula, director of Alcohol and Drug Information Centre India (ADIC-India), says Kerala has very high per capita consumption rate - above 8 liters, and at times it crossed 21 and 24 liters per capita per annum. The World Health Organization (WHO) 2010 data published in 2014 report reveals that India’s average recorded and unrecorded alcohol per capita consumption of alcohol was 4.3 liters. In Russia, for example, it is 15.1 liters. “Drinking pattern of Kerala is different from any other state. It is hazardous drinking, drinking for intoxication that is a curse of the state, not the social drinking,” says the expert. According to Edayaranmula, 5% of hospitalisations, 69% of crimes, 40% of road traffic accidents, 80% of divorces and domestic violence in the state are linked to alcohol abuse. The sales of liquor in Kerala have been under control of the government-owned Kerala State Beverages Corporation Limited (BEVCO) for three decades, and all its 338 retail shops look alike: a metal grill separating the seller and customers and long queues outside the shop. Liquor is a highly taxed commodity in Kerala, with 100% excise duty, KSBC margin, sales tax, and turnover tax and service tax. The total tax burden comes to about 350-400%, which accounts for high prices. Liquor sales contribute more than 23 per cent to the state’s revenue. The ADIC-India study revealed that Kerala’s revenue from alcohol increased from US$ 6.5 million in FY 1987-88 to US$ 1.2 billion in FY 2013-14. The entire effort to limit sales of alcohol in the state, first by introducing heavy taxes, then by restricting the working hours of the bars and now by reducing the number of them aimed at limiting consumption. However, Edayaranmula tells RIR that the government introduced prohibition without studying ground realities, hence it faced fierce opposition. “After the next year elections, this government will change and the new government will define the new policy”, he says. Biju Ramesh, president of Kerala Bar Hotels Association (KBHA) which has been in the forefront of prohibition debates, says most 418 bars closed by the government earlier have recently restarted under “beer and wine” license. He, too, believes that the new government will come to power next year and the liquor policy will be revised. Naveen Raj, the owner of a restaurant in Varkala whose liquor license was not renewed, admits that he is losing on alcohol sales. However, he added that most of the tourists come for food while alcohol is a secondary interest. “But Russians are hard drinkers. If you go to a liquor shop in town, all Russians are standing there in a queue,” he says. “The number of Russians are increasing in Kerala, but most of them try to buy liquor on their own or ask their travel agents who live here all season long, rent properties and lease it to the tourists, to do that”. Ramesh told RIR that tourism, both foreign and domestic, was affected badly in the current tourism year. “Lots of conferences shifted from here to Goa and Bangalore. Speaking roughly, tourism was 50% low comparing to last year; one of the reasons is that Kerala was marketed as a dry state even by the travel agents”, he added. The Kerala government’s total revenue from tourism during 2013 amounted to US$ 3.7 billion, showing an increase of 12.22% over the previous year’s figure. The Tourism Department is yet to announce the figure for 2014 year. Victoria Dmitrieva, translator, Indologist and individual tour organiser from St.-Petersburg, who has been living in Kerala for the last seven years, believes that the so-called liquor ban did not have any effect on tourism. “There are liquor shops everywhere in Kerala, but yes, not many of them. Moreover, in every restaurant or bar they will serve you drinks on request, although most of them do not have the licence. So it’s not true that alcohol is not there in Kerala, it is available,” she told RIR. “Frankly speaking, I am happy that it is not like in Goa where there is such an epidemic of hard drunkenness and drug abuse”. Kanakan C, the manager of Green Palace hotel in Varkala, says in past 7 years the sales of beer and wine in the restaurant attached to the hotel have been contributing less than 10 per cent of the total revenue. Thus, he is less concerned about not being able to serve other drinks to the clients. “We are focused on good food and good service. I don’t remember clients going away just because we cannot serve some drinks,” Kanakan says. Kirill and his friends found it much easier to buy drinks in Goa, yet they still prefer Kerala for its beaches, cleanliness, nature and people. “Probably, next time we would fly to Goa, buy booze and move to Kerala,” Koteshov says. He suggests that tourists befriend local people who will definitely know how and where to get a drink or will guide to a local toddy shop which itself is a great experience. Toddy is a cheap traditional drink with low alcohol content produced from the fermented sap of the palm trees; it has been consumed in Kerala and other Indian states since ancient times, mainly for health benefits.